Find out what to do and where to eat on this vibrant tropical island just off the Yucatan Peninsula of Mexico. E.A. Farro, writer and scientist, travels with her family, but also spends time with young backpackers and older tourists from all over the world. The island is romantic, and without cars it offers a rare kind of relaxation and a chance to get back in touch with what is important in life. Farro’s writing combines a sense of place with practical information that helps readers makes the most of their time on the island. A hand drawn map shows all the highlights, including the best places to eat and stay. Athyrium Travel guides provide authentic details to help you plan and enjoy traveling to new places. Written by professional writers, they always make good reads. They can even be a way to travel without going anywhere. 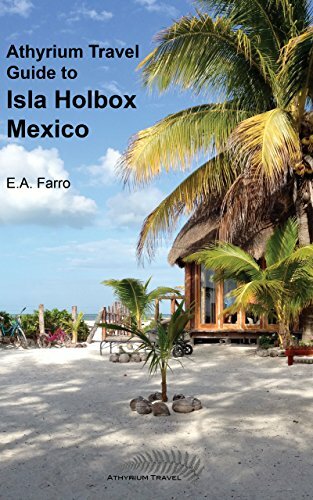 Ten percent of all sales of this book will be donated to the Isla Holbox Spay and Neuter Project (http://www.holboxspayneuter.com/).